For the past five years, I’ve enjoyed your writing and adventures, specifically in PM and PS. My family and I just relocated to Appomattox, Virginia and we have some great Oak and Walnut trees on our small farm. 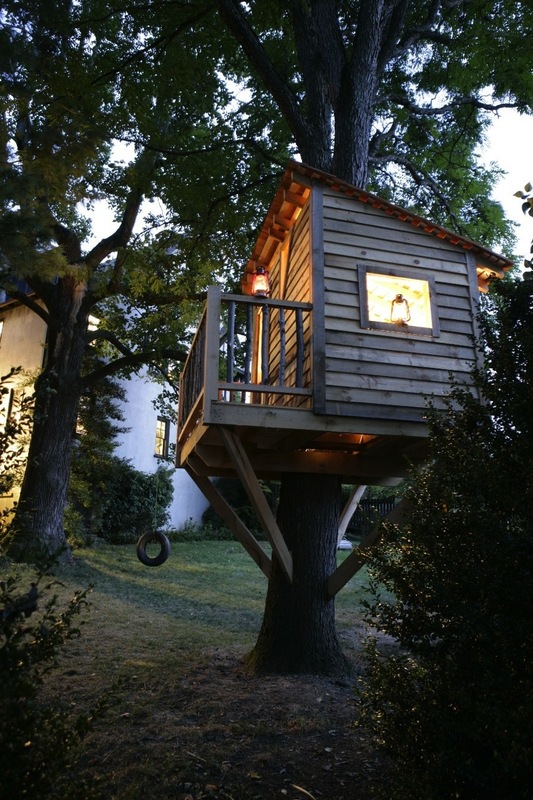 I conducted an engine search on tree houses and your 2010 article was one of the first that surfaced. Thanks so much for sharing your thoughts and experiences. I’ll benefit over the next year as we build our own tiny “above ground fortress” to protect and nurture the imaginations of our family. Thanks! I am almost done with your book, See you in a Hundred Years. What a great book. My husband and I live in Swoope and bought a small 1816 farm about the time you did. We are not originally from this area, and I found the book humerous and interesting. I must say, I am not thrilled how the roosters were killed..ugh. Also, we love our post lady Jeanie and cannot wait to hear her reaction about her in the book!! Any new books coming out? Hi Sally! It’s nice to know you’re enjoying the book. Being a Swoopian (Swooper? Swoopester? ), you’ve got an interesting perspective. If you see Jeannie, please give her my best! I just finished your book, having waited years for it to be available on my Kindle – finally breaking down and reading it the old fashioned way! I have to say I envy you the experience, although not the backbreaking work. I am surprised you gave up gardening so easily, but am glad you are doing it on a smaller scale once again. I grew up, and lived only in big cities, but have always been nostalgic for self-reliance of the ‘old’ ways. Any time I can participate in any way I feel so fulfilled. My tiny community garden plot isn’t as successful as I’d hoped, but I totally love every aspect of the seed to table activities. Your tree house design has totally inspired me. I have been sketching out a bunch of ideas for one for my kids and you have totally solved my undercarriage issues. In my case, the tree is in bad shape, so I was going to top it, leave an 8′ stump, and just plop the house on top. Looking a few years down the road, has it been plenty stiff enough in the wind? Do you feel like you overbuilt the walls? I was planning on 24″ studs just to reduce weight aloft. As your kids have gotten older, is it still big enough, or would you bump it a bit bigger? Hi Mr. Ward, I just finished reading your book “See You in a Hundred Years” and I can’t tell you how much I loved it!!! I’ve stayed up late and read at work the past week in order to finish it as quickly as possible. I’ve never had an assignment (I’m reading it for my Radford core 201 class) that I’ve enjoyed so much! I live in Virginia, about an hour and twenty minutes away from Swoope, and this area’s history is just so interesting to me. I’m going to take an Appalachian studies class this semester as well, and I’m interested to see if it has any correlation to your book’s content. I think we get to meet with you sometime during the first few weeks of class, and if that’s true, I can’t wait! You’re stories of your son’s playful two year old nature cracked me up throughout the book, and those of your hardships were very concerning and touching. I was also very happy to read at the end of your book that you and Heather were able to conceive your daughter (and that she’s so interested in nature! ) Thank you for a fun, interesting, and inspiring novel, and I can’t wait to read more of your work. P.S. I know its random but I love making jewelry, and the bracelet you made your wife was probably one of my favorite little things that you did…so creative, resourceful, and sweet! Hi Logan, I have just read your book : 100 yrs, for the second time. I got lost in your words on describing the ways of life. My husband and I have a small place outside of Nashville Tn. and we love the country life as well as keeping our lives as simple as we can. Reading your book for the second time was so refreshing. Many blessings to you and your family. Thank you for sharing. That’s a great compliment, April. Thank you! Hi, Renee. I’m sorry the language offended you. You’re right that there are good stories that don’t include profanity, but they’re good because they’re emotionally honest. I felt it would have been less honest to scrub those words from my story. Thanks for letting me know your thoughts. I hope you can read the book anyway. Maybe my choices will make more sense once you reach the end. Logan, just finished See You In A Hundred years. Couldn’t put it down, how incredibly talented you are to relay the experience into words. Loved it! I just finished your book See You In A Hundred Years. I have a Staunton address and live in the county near Swoope. I happened upon your book and it looked interesting. I had no idea until I read a little that you and your family chose Swoope for your 1900 experience. I was ecstatic when I found out! I read it enthusiastically, and could hardly wait to find out “what happens next!” Turns out my husband knows some of the Swoopians in your book. It has been pure delight to read your book. I admire you and your wife for what you did. I feel in a small way I got to know you and your wife because of the honesty in which you tell the story. You and your wife are somethin’ else!!! 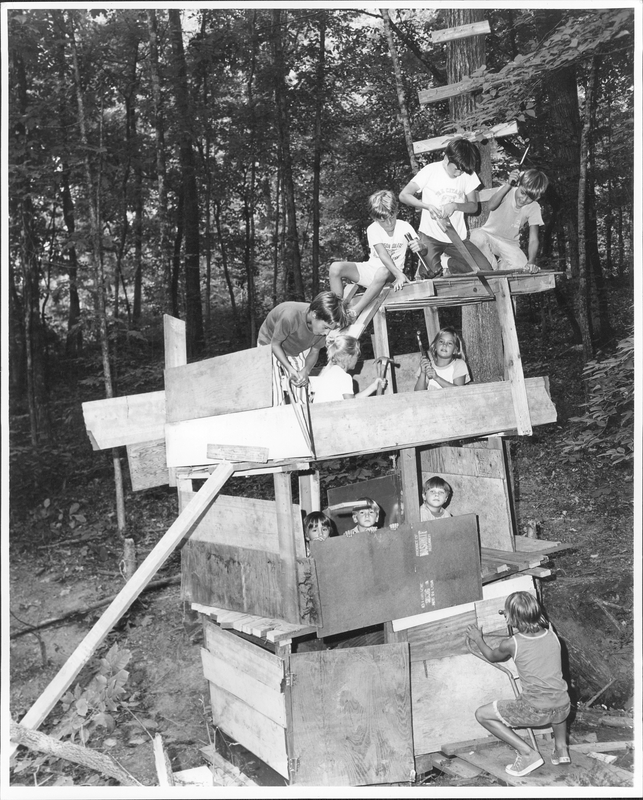 I recently read your tree house article in Popular Mechanics. I would like to build one similar for my son. Would by chance have the dimensions you used? If you’re willing to share, of course. Thank you in advance! I don’t have any dimensions or plans to send, but you can find a similar design in a guidebook, Black and Decker’s Complete Guide… I’m including the link below. Good luck! Enjoyed the paperback “See You in A Hundred Years”, much like I had enjoyed Laura Ingall’s semi-fiction stories of a similar life. It has only strengthened my belief that we would be happier & more content learning to live with less but like you I wouldn’t give up all advances. P.S. I am curious why some of those who helped you weren’t mentioned in the Thanks at the end of the book. Glad you enjoyed the book, John. I changed a few names in the book but thanked them in the acknowledgements using their real names. I should have made that clear–you’re not the first person to ask!